The icon that comes to visit St. Matthew’s was written (icons are “written”, not painted) by Master Iconographer Sherry V. Lynch and presented to the Episcopal Church in Alaska at the Diocesan Convention in Anchorage in October 2009. The image, a joint project of the artist and her husband Ron Ridnour of LaCenter, Washington (who prepared the 16 ¾” X 26” wooden support), is called “Our Lady of Alaska” and incorporates traditional SouthEast Alaskan Native symbols into its traditional design of Mary and the Christ Child. . Below, the artist explains the symbolism. The panel shows the Madonna seated on the bench of a plank house, holding her young son on her lap.The background and seat are ornamented with a priceless Chilkat blanket, and a traditional Northwest Coast button blanket. The Madonna is painted in traditional icongraphic fashion, wearing a red “maphorion” or cloak, ornamented with gold stars on her forehead and each shoulder – representing her virginity before, during, and after the birth of Christ. The upper part of the background of the icon is covered in copper metal leaf, representing the early contact between Europeans and the Native cultures of Alaska.The golden halo of the Mother supports a rendering of an eagle and a raven, the two halves (or moieties) of the Tlinget Nation, supporting the sun in their beaks. A bentwood box serves as the Madonna’s footstool, and represents the designs of Raven and Eagle. A carving of the Full Moon, derived from a traditional frontlet headdress of the inland Tlinget, is centered between the images of Eagle and Raven. The Christ Child is shown in full festival regalia. He wears a traditional woven Chilkat dancing tunic, and red cedar bark necklace symbolizing His elevated statrus. Three heads derived from Chilkat weaving symbolize the Trinity, and are surrounded by winged heads done in Chilkat style.These are included because of their similarity to those of classical icons, representing the cherubim and seraphim which surround the throne of God. In His right hand, the Christ Child holds a silver Alaskan confirmation cross (which is also on the back of the icon). In His left hand, he holds the scroll of the OldTestament, indicating that all the prophecies of the Old Testament are realized in the Holy Child. In all icons, the Christ is the only personage wearing the so-called “Cruciform nimbus”. The Cross within the halo is often described with a word translated as “Being”. Sometimes the cross arms are inscribed with ornaments or gems. In this icon, the Child’s halo is ornamented with 3 gems – roundels of mother-of-pearl used traditionally in Nortwest Coast art. The four raised corners of the icon are renditions of symbols of the 4 Evangelists - Matthew, Mark, Luke, and John. On the side of Christ’s head are the Greek letters abbreviating the Greek words for “Jesus Christ”. On the side of the head of the Virgin, are the Greek characters that, in abbreviation, denote "Holy Mary" and "Mother of God". The Cross on our Altar was given in memory of Lucy Rice Woods. It is in the form of a Calvary Cross, so called from the three steps of it's base. They represent faith, hope, and love. The points fo the Cross are decorated with the dedal-like design of the fleur-de-lis, which is associated with the Virgin Mary and the Trinity. The INS in the middle is of such ancient use that no one is sure what its meaning is . . . except that it probably is some kind of abbreviation of Jesus' name. 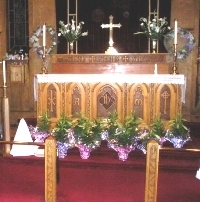 OUR ALTAR: The original structure was consecrated in memory of Cornelia Converse Wentworth in 1904 (the earliest date for this parish). The carvings, done by nurses, clergy and congregation, were completed in 1906. It is made of native Alaskan birch. Symbols and words are all either Latin or Greek. The vine carving, picked up in the Altar rail and lecturn reminds us that we are part of God's vineyard. Our two Stained Glass Windows: Both were executed by a Buffalo, N.Y. firm. The Epistle side window was designed by Sarah Edmunds. It symbolizes the Christmas story. Gifts of ivory, fish and fur are being offered. The Gospel side window was designed by Gaile Haynes. It centers on the Easter event and the angelic announcement of the empty tomb. The Totem pole, traditionally used as reminders of great events or people or stories, here is in the shape of the Cross. The medium is leaded colored glass with painted details. "I made the claim for this Church that it meant light: that it meant more light here in Fairbanks." So wrote Archdeacon Stuck about the first services held at St. Matthew's. It was Sunday, October 16th, 1904. The Church filled for services both morning and night. Though an Episcopal service (thanks to the mission in Circle) had been held the previous year in the Fairbanks Saloon, this was the formal beginning of St. Matthew's. Since the calling of the bell that first Sunday, the log church has continued to bring together, across all racial, cultural, and economic boundaries, from Fairbanks and throughout the Interior, everyone - prospectors, trappers, business leaders, visitors, dreamers, pioneers and the newly arrived. 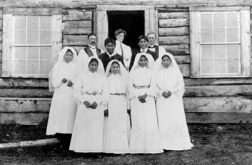 St. Matthew's contributed the first Hospital (built on the adjacent lot, providing the only medical care in the area, see 'Founding of St. Matthews Hospital', from the Alaska Churchman, the first library (a reading room in the church), the first kindergarten, and the first Boy Scout troop to the life of Fairbanks. From the doors of St. Matthew's, Stuck led the first successful ascent of Denali; churches were established along the Tanana River; and the first meeting of the Tanana Chiefs was held with the Federal Government. St. Matthews is one of the three oldest churches in Fairbanks, located on First Avenue, across the street from the Chena River, in Fairbanks, Alaska. The original church building burned in 1947, but the great wooden altar and other carvings were saved, and were replaced with the present St. Matthew's Church building. First services in the new church were held Christmas Eve, 1948. It's congregation numbers about 1200, over half of which are Alaskan Native. The Lord's Prayer is prayed nearly every Sunday (if a speaker is present) in the Gwitch'in, the Athabaskan language, as well as in English. 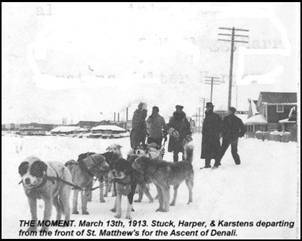 On March 29, St. Matthews began celebrating 100 years of ministry in Fairbanks. St. Matthew's has a large outreach; especially for a church it's size. In addition to three Sunday services, St. Matthew's also holds services at the Pioneer Home, Denali Center, and the Fairbanks Correctional Facility. Midnight Compline is held at the church Sunday through Friday nights, and other special services are held as well. St. Matthew's is a warm and welcoming place, and many people report feeling immediately at home here. Many others have turned to St. Matthew's to find a haven or a sanctuary in times of stress or need. The story of the beginning of the Church's work in the center of a mining district in Alaska must, in the main, be a repetition of what has occurred again and again during the four hundred years in which she has been keeping pace with her sons in their march from the borders of the Atlantic to the slopes of the Pacific, and still westward until she has finally planted her standard on the inhospitable shores of the Bering Sea. The trail breakers of Alaska have been the traders and the prospectors, and Fairbanks follows the historic order. In 1899 and 1900, when things had settled down in Dawson and Circle City and Birch Creek had again become the centers of work on the American side, prospectors began to turn southwest towards the Tanana valley, and early in 1900 the first mining camp was established in this district on Faith, Hope, Charity and Homestake Creeks, tributaries of the Chatanika, which is itself one of the largest tributaries of the Tanana river. Here a little open-cut work was done. In the summer of this year a party of five, among them Mr. Abe Spring who was very closely connected with the early history of Fairbanks, crossed to the opposite side of the Chatanika and worked their way down as far as Cleary Creek, finding encouraging prospects but no pay. In the meantime Captain Barnette, whose name is indissolubly linked with Fairbanks, had with many other Americans left Dawson and was wintering at Circle City. Mr. Spring, returning from his prospecting trip to Circle just at this time, strongly advised him to carry out his scheme of starting a trading post on the Tanana river. That winter the Captain went to San Francisco, bought a lot of goods and brought them to St. Michael, starting up the Yukon on a little steamer, the "Arctic Boy", which he had rebuilt for this purpose; but she was not strong enough to withstand the swift current of these northern rivers and was wrecked. Returning to St. Michael he made a contract with the owners of the steamer "Lavelle Young" to carry him and his goods up the Tanana river as far as Tanana Crossing. But with him as with many others Bates Rapids proved an insurmountable difficulty, and failing to get past them an effort was made to avoid them by returning to the present site of Chena and running up this slough to a point where it joins the Tanana far above the Rapids. Before they had nearly reached the desired point the water began to fall very rapidly and the owners of the steamer refused to go further. Returning down stream to a fine belt of timber which they had noticed on their way up, the Captain landed, and though greatly disappointed, he at once set about building a substantial cabin and established his trading post. This was late in August, 1901. One of the most attractive stories told of these days is that of Felix Pedro, who, while passing through this district on a Government survey party, discovered gold on a certain creek. For good reasons he said nothing about it. When his party reached Eagle he severed his connection with it, and the next summer he returned to locate his creek. The months slipped into years and still he failed to find it, but he kept on searching and prospecting. One day while out hunting in the hills surrounding this valley he saw smoke ascending, and coming down to see what hardy stranger had invaded this silent wilderness, he found the trading post. He spoke of having found good prospects on Pedro Creek. This news soon leaked out. Stories grew apace, and that winter a Japanese cook employed at the trading post stopped at Circle, Eagle and Fortymile enroute to Dawson, spreading the report of a rich strike. It takes but a spark to start excitement among gold seekers, and the story was no sooner told than a big stampede began, but it was a wild goose chase, for nothing thus far had been found to warrant it, and the great stampede of March and April 1903, was quite equaled by the general exodus of May and June this same year. On the thirteenth of March, 1903, the Rev. C. E. Rice left Circle City for Fairbanks. Miss Farthing and Miss Woods had equipped him with food enough to last until navigation opened. It was very cold and, fearful that he might get badly frozen, they charged Esias, the Indian boy who was to act as his guide, to be very careful, specially about foot-wear. He drew himself up and with grave Indian dignity said, "I know my own country". They had a hard trip, encountering a blizzard, and that not only forced them to lay off for a couple of days but made traveling so difficult that the journey of two hundred miles took them twelve days. They reached Fairbanks Wednesday, March 25, and the following Sunday Mr. Rice held Service in the old Fairbanks Saloon.The first stampeders were turning their backs upon the creeks and swarming out, with nothing but anathemas for the new camp. Even blazed trees bore scathing testimony to their feeling of personal injury in having been allured into such a good-for-nothing country. Unfortunately Mr. Rice caught the contagion of distrust, sold his grub, and six days after his arrival in Fairbanks started for Circle. Before he left he staked three admirably chosen lots for a Mission but as no improvements were made and there was no one to look after them they were jumped. Now, six thousand dollars is asked for one of those lots. With only a woman's faith in what they felt was a great opportunity, Miss Farthing and Miss Woods shed some tears of disappointment when Mr. Rice returned so unexpectedly. I wonder how they would have felt could they really have looked into the future! Nothing further was done until Bishop Rowe arrived in February, 1904. By this time the mining outlook was much more hopeful and the Bishop with that wise foresight which has characterized the selection of all his sites for Mission work, selected lots once more for a Church and Hospital; appointed a building committee, putting one thousand dollars in their hands and agreeing to furnish, equip and maintain a Hospital, provided the residents of the district subscribed sufficient additional funds for the erection of a building for that purpose. The original plan was that the building was to be of logs, two stories high, and was to cost two thousand dollars. The Bishop then called the Rev. John E. Huhn from Rampart and appointed him Chairman of the Building Committee. The Committee finally decided to erect a two-story frame building; a little over one thousand dollars was raised in the town and the building was begun. The frame, fifty by thirty feet, was put up and enclosed with a single thickness of shiplap, the roof put on, a single floor laid upstairs and a double one downstairs. On the lower floor double partitions were put up; the doors and windows cut and the casings put in, the inside doors were hung and a stairway built. Then a telegram was sent to the Bishop saying all was ready and asking him to send a nurse at once. Miss Carter left Skagway with all dispatch and arrived here early in August with Mrs. Chadwick who was to act as cook. Two weeks later Miss Farthing came from Circle. 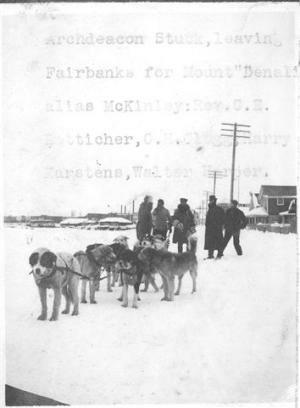 Fairbanks was then a town of about six hundred, with probably about six hundred more men on the creeks. Mr. Huhn, in answer to the Bishop's call, had come over from Rampart in March, but he ran out of provisions, and not being able to get any here he went back to Rampart and did not return to Fairbanks until well on in July. While he was away one of the Mission lots was jumped. He remained for two or three weeks in July and again returned to Rampart. Our prospects were not very bright; the building was only a shell upon which our two thousand dollars had been spent and with a debt of fifteen hundred dollars upon it as it stood. The single thickness of shiplap which inclosed it had shrunken, leaving generous cracks. The window casings were entirely too large for the windows that the Bishop had sent; so there were no windows in. Three or four of the front casings had cheese cloth tacked over them. There was no door hung at the back, and only a few boards nailed together swung in front, and we had but one stove - the kitchen range. Fortunately our outfit, which had been ordered by the Bishop in San Francisco, had arrived, and when Mr. Huhn came over in July he had brought some beds and hospital equipment by the Bishop's request from Rampart. So we set about getting things in such order as was possible. The first day of September Archdeacon Stuck and Mr. Huhn arrived. Then things begin to move. Captain Barnette promised to lend us enough money, without interest, (money then bringing ten percent a month), to complete the lower floor. The Archdeacon called the building committee together and dismissed it, and he and Mr. Huhn collected nearly a thousand dollars. The building was properly inclosed and the first floor put into usable shape. Five airtight stoves were put in to heat the building. On the fifteenth of September our first patient was brought in desperately sick with pneumonia; the next day a poor sick fellow was brought to the door who had been driven more than twenty miles over a terrible trail in a great lumber wagon with no springs. Then a case of typhoid, one of rheumatism; then the young Irishman who, believing the stick that he held was the invincible shillalah, attacked a wounded moose with it and got a Pott's fracture for his pains. So they came, until, by the end of the month we were overcrowded. Just here a grave question confronted us. The camp was threatened with a serious shortage of food, and the few weeks we had been here sufficed to show that our supplies were entirely inadequate. The Northern Commercial Company could not give us credit, and we not only had no money but were heavily in debt. Our only alternative was to telegraph to the Bishop. Though the message was sent on the eleventh day of October, through the inexcusable thoughtlessness of a clerk we did not learn until the day before Christmas that the Bishop had promptly telegraphed one thousand dollars credit to the N.C. Co. These were troubled days. The nursing had got beyond our strength and we had to hire a man nurse; for some time longer we managed the night work, but one after another we gave out and finally had to get a man for nights. As winter approached, the carrying of the wood (it takes about a hundred cords of a year for heating and cooking), keeping the water-hole open and carrying water from the slough and disposing of all that had been used, with other chores, was all another man could do. I said that we were overcrowded; something must be done to enlarge our quarters, and the only way to do this was to complete the second floor. At this juncture the city council came to our aid, proposing that they loan us twelve hundred dollars which we were to repay by caring for indigent patients at the rate of two dollars per day. As we had been caring for many penniless men we were glad for any help in this direction, and this we calculated was about two-fifths of the cost per day. Up town men were paying one dollar for a meal; any sort of a room was forty-five dollars a month; a single bed, which generally meant in a bunk house, was a dollar and a half per night, and a double bed two dollars and a half per night; laundry was proportionately high. We gladly accepted the city's offer, and at once the contract was let, though the money at our disposal, with lumber at one hundred dollars a thousand and carpenters' wages at fifteen dollars per day, only permitted of the work being done in a very rough fashion. Twelve windows were cut, the roof ceiled, double partitions with sawdust between enclosed the operating room, and a single thickness of shiplap divided a large ward for the men, a small one for women and three private rooms. A system of enclosed pipes, drums and registers carried the heat up. We had to have some wooden beds made, and were most fortunate in getting some hay for mattresses and pillows. A few of the very simplest furnishings for operating rooms and wards brought our expenses up to two thousand dollars for enlarging. The sixteenth of December we moved our patients upstairs. Once more we found our food supply getting very low, and again we were obliged to send word to the Bishop, who telegraphed us another thousand dollars. In June, 1905, Archdeacon Stuck collected nearly nineteen hundred dollars on the creeks. Then the tide turned; through the kindness of Doctor W. G. Cassels we got the contract for the railway patients and for one of the sawmills; and though the time had come when we had to put our second floor into better shape we could face it with renewed courage. A double floor was most necessary; as were permanent double partitions. The upper hall was extended through to the back, dividing the men's ward in two and giving a much needed outside door and back stairway. The interior was clothed and papered and the woodwork painted, which converted our ugly old building into a bright, attractive place that we were all proud of. The building had become so dry that our five stoves were a serious menace, and we dare not run the risk of using them another winter. This meant the putting in of a furnace, which we were enabled to do by the generosity of our friends in the East. June the twenty-seventh, 1905, Miss Emberly arrived, and a great load was lifted, for she took entire charge of the care of the patients. From the beginning Miss Farthing has taken charge of the housekeeping while being my neverfailing right hand in the Hospital work, and now our Staff was complete. In August of this year Mr. Huhn returned to Rampart and Rev. Charles E. Betticher, Jr. took charge of the work here. In November, 1905, our last debt was paid. Since we began our Hospital work, not quite two years ago, three hundred and fifty patients have been cared for within its walls. What one reads in these three hundred and fifty names! - strong young men overtaken by accident or illness, old men with but little vigor to throw off the effect of calamity; women, a few walking in honorable paths, but the greater number desperately flinging their lives away; old-timers who spin thrilling tales of adventure; chechacos just off the trail - Americans, Canadians, Englishmen, Irishmen, Scotchmen, Australians, Norwegians, Swedes, Danes, Finns, Germans, Russians, Frenchmen, Italians, Indians, and Negroes, - injured in the mines, frozen on the trail, or overtaken by rheumatism, pneumonia, typhoid fever, appendicitis, nephritis, or one of the many other maladies that human flesh is heir to, - most of them leaving our doors with restored health and energy, but some who came to us chronic invalids to await the opening of navigation that they may get "outside", and a few to be carried out and laid in the quiet little cemetery on the river bank. Beyond all else in the lives of these people, and indeed in Alaska, stands out the mad struggle for gold - gold that has been made in the worst sense filthy lucre and the mammon of unrighteousness, but gold, too, which we can say gratefully is clean gold, taken honestly by good men from mother earth and used by them for good purposes. Only a few days ago a young man said to me, "Yes, I have a dear old mother in Norway, and every Christmas my brother and I send her money. I'm going home this summer to see her." But our strength lies in the link that binds us to the Church, in the fact that we are part of St. Matthew's Mission; that in coming to St. Matthew's Hospital men are brought within the sound of the Gospel, the Clergy mingling with the patients during the week and holding a short service for them on Sunday. One of my sweetest memories of our early days is of the Service of Holy Communion held in the early morning in one of the bare Hospital rooms, with the sewing machine arranged for an Altar and a pile of boxes for Credence Table. Then came the glad day when St. Matthew's Church was completed and we could look out upon the pretty log chapel with its quaint belfry holding the bell with the Bishop's inscription "O ye Frost and Cold, bless ye the Lord; praise him and magnify him forever". And in that little Chapel we have ever since found the strength which has enabled us to meet the demands and the privileges of our work. This photo is a keepsake and we should use it before I ever get around to taking it out to the Archives. It's from the Lumpkin collection given to us several years ago. It is THE Moment.March 13th, 1913. This is Stuck departing from in front of St. Matthew's for the First Successful Ascent of Denali. "Archdeacon Stuck, leaving Fairbanks for Mount "Denali"alias McKinley; Rev.C.E. Betticher, C. H. Clegg, Harry Karstens, Walter Harper". I can identify (just from seeing other photos) as Stuck in the middle behind the handlebars, and Harper on the far right. Stuck, Harper, and Karsten (with Robert Tatum, whom they picked up in Nenana) June 7th. I scanned it from the Lumpkin photo album.